These decadent, low calorie sushi rolls are the perfect pre-dinner appetizer with which to impress your guests, yet also work great as finger food as part of a buffet. Each marries the contrasting flavors of tuna and salmon with a spicy fish tartar, blended with the more delicate flavors of sushi rice and avocado. Eye-catching and delicious, they’re so easy to make, you could easily knock out several batches in under an hour! Beginning with the salmon filet, cut the filet in half – or, so that you have two rectangular pieces equivalent to five fingers (approx. 10cm ) in length. Repeat for the tuna steak. Next, create thin slices of sashimi by positioning your knife almost horizontally along the top length of the salmon filet and gently slicing across. The knife should glide effortlessly through the flesh, with only minimal pressure needed. Use your other hand to hold the filet firm as you make each cut. Your slices should be just a few millimeters in thickness. Repeat this process with the tuna steak. Retain any off-cuts of salmon and tuna to make the tartar later on. Transfer a small amount of cooked white sushi rice onto your chopping board. Using your fingers, fashion the rice into a rough circular tower approximately 1.5 – 2 cm in height with a flat top. Add a little more rice if necessary to ‘build up’ the small tower. Next, take a thin strip of avocado and wrap it around the perimeter of your rice tower. Ensure the green strip of skin is level with the flat surface of your rice at the top. Encase the rice tower in a strip of salmon, pressing gently where the two ends overlap to ensure they stay in place. To seal, simply wrap a thin strip of nori around the base of your circular creation. The moisture of the fish will help the overlapping end to seal, so there’s no need to squish a piece of rice against the nori to help it adhere. Repeat this process to create your tuna wrapped sushi roll. Set aside while you prepare the tartar. To prepare the salmon and tuna tartar, you will first need to dice the off-cuts of fish from earlier using your knife. Keep the tuna and salmon separate from one another, as you will be creating two varieties of tartar for your sushi rolls. using a fork or small spoon. Line up your tuna and salmon wrapped sushi rolls on the chopping board. Using your forefinger, gently press down the rice in each one to create a flat bed for the tartar to sit on. Beginning with the salmon wrapped rolls, spoon a little of the tuna tartar into each. Next, add the salmon tartar to the tuna wrapped rolls. Spoon enough of the mixture into each that it heaps at the center, but don’t go overboard, or you run the risk of it spilling over the sides. Sprinkle a few chopped chives over your creations to finish. Serving Tip: Arrange your sushi rolls in an alternate fashion (ie. 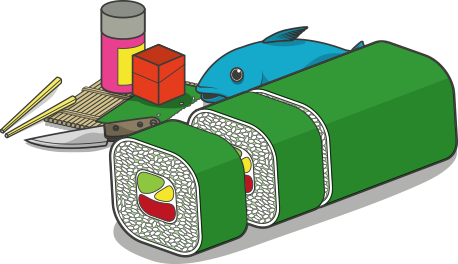 one salmon roll, followed by a tuna roll) in rows on your plate, leaving space between each. Drizzle a little soy sauce between the spaces, allowing it to pool naturally around your sushi rolls. For a more organic and eye-catching presentation, consider creating a more elaborate center-piece using our circular tomato garnish and cucumber fans. The pink-ish red of the tomato will be a beautiful visual compliment to the pink of the salmon, and the darker tuna steak!